Have you ever wondered about the seemingly endless parade of hats that are carefully placed upon the driver's head after winning a race? Among the drivers lucky enough to make their way to Victory Lane, it's called the "Hat Dance", and each sponsor who helps pay for the team will get their turn on their winning driver's head. But to some drivers, after the adrenalin filled rush of victory, it can be anticlimactic to go through the "Hat Dance", but in exchange for the dollars pledged by a sponsor, it's a small price to pay. Jeremy Mayfield shows off his motor oil sponsorship during the Hat Dance. 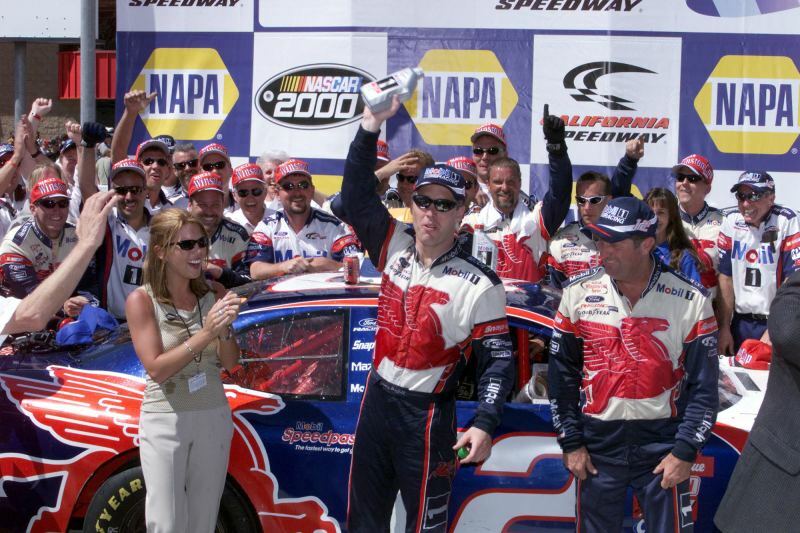 After winning a race, the driver has all but a few minutes to celebrate with their team, and then it's off to the victory lane interview, changing of the hats to show off each sponsor for their team, drinking the drink that sponsors them, wiping the sweat off their face with the sponsored towel. It's all part of the unspoken rules of sponsorship. While the team gets together with the trophy, hats are thrown at them to put on and then take a picture, another hat is put on, then take another picture, and depending on the number of sponsors and hats, it can take some time to finish the Hat Dance. By the time the Hat Dance is complete, the drivers have little time left to celebrate the win with their team. But it's all part of the game, and the team and the driver wouldn't get the opportunity to compete if not for the sponsors. Sponsors are a big part of racing today; without the sponsors there would be no "Winston Cup", or "Busch" series, or even the "Featherlite" modified racing. But there are strict rules to go along with the sponsorships. Whether it is drinking Coke or Pepsi, splashing the team with Gatorade, or a host of other sponsorship opportunities, everyone involved gets their piece of the win. Rusty Wallace poses for the cameras wearing his manufacturer's hat. The rules can be very strict for the drivers; Dale Earnhardt Jr. says "basically in my contract it says that if I am caught or seen drinking anything other then alcoholic Bud product, if it's not Bud, they can yank the contract, they can sue or whatever they want". Depending on the level of sponsorship, a primary sponsor may have millions of dollars invested in a driver. For the most part, they have a tremendous interest in what they are sponsoring, but some of the rules and dos and don'ts tied to these contracts can be very limiting. When asked about his thoughts on sponsorship, Dale Earnhardt Jr. discussed his experience driving the Budweiser Chevrolet: "You see sponsors change from car to car and you realize they have interests of what's going on. They don't put their name out there just to be out there, they want their name on the car that's up front. After the race is over with, you get out of your car, and all you want to do is go to your crew and high five, throw beer on each other, and just wrestle on the floor, but they made it so uniform that you get out, you speak to the camera and talk about the race and take pictures and do the "HAT DANCE". Tony Stewart, driver of the Home Depot Pontiac, had similar thoughts, "they call it the hat dance, you win the race and they start throwing hats on you. There are so many sponsors that make it possible, that's why when you win a race they start throwing hats at you, you put on a hat and you don't even know who's hat it is, you just know you have to just take the picture because it's a sponsor." 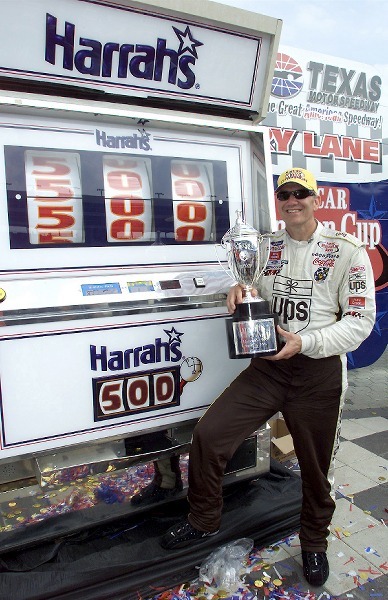 Even race sponsors get in the act as Dale Jarrett poses for his Harrahs 500 victory. "It can be a pain", continued Dale Earnhardt Jr. "there are like two dozen boxes of hats, and you're sitting there with the trophy and your putting on the sponsor's hat and you take a picture. Change hats, put on another hat, take a picture. It's one after the other, it's annoying! By the time you're done, you're hurrying as fast as you can so you can celebrate with your crew and by the time you are done, you're crews gone, your car has been rolled off to inspection, my dad is like on his jet back home. There is no one to celebrate with; you're just sitting there with a box of hats." Sponsorship of a race team is an investment in advertising and public relations. Whether it is Budweiser or Home Depot, the sponsors become one with the team, and when the team and driver put it all together; everyone winds up in Victory Lane.